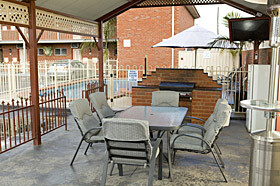 Courtyard Motor Inn has a range of facilities to make your stay comfortable and relaxing. Whether you want a BBQ dinner, a swim in the pool, or spend the night with movies and snacks, we have the facilities for you. For total relaxation, we offer our pool and spa. Please give us advanced request for the hot spa so we can prepare it for you. Pool towels are available on request. Cook up a storm using our free gas BBQ. Nothing beats freshly cooked meat while you enjoy quality time with family and friends. There are plates, cutlery, and utensils available upon request. If you have packed light, not to worry as we offer guest laundry for washing and drying clothes. We hold a full liquor licence. A wide range of wines, beers, mixed drinks, and soft drinks are available at reception. Each room also has a mini-bar, a selection of drinks & snacks for your convenience. If used, please complete the mini bar charge slip & present for payment at checkout. 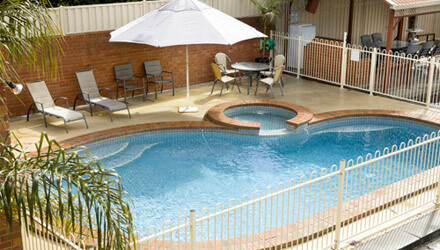 We have an enclosed playground to keep the kids entertained. Free wifi is available in all rooms. Check your email, social networks and browse the internet for no extra charge! Our facilities are built to ensure that your stay is as comfortable, convenient, and relaxing as possible. Book your room online, or call us on 03 5831 2355.